This year’s World Usability Day took place on November 11th 2018 and for the first time ever Karlsruhe joined a number of other locations in hosting the event. As all available seats were booked three weeks in advance, the WUD was well attended. Participants discussed the thought provoking talks concerning the topic “UX for Good or Evil” while enjoying the provided snacks and drinks at the Hoepfnerburg in Karlsruhe. The WUD Karlsruhe was brought to life by the young Karlsruhe based company Usertimes, aiming to provide the local UX scene with a platform and a shared time and place to make connections and exchange experiences. Usertimes develops software solutions that help product development teams who aim to work user centric. Their main focus is the development of a platform that aids designers in evaluating customer data and usability test results with the goal of ultimately automating repetitive processes. 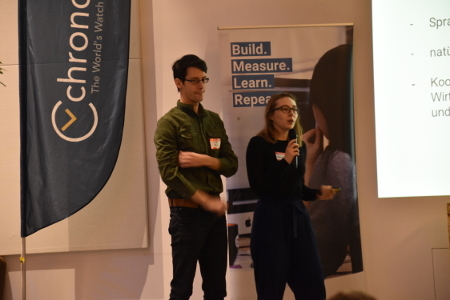 On top of that the event was supported by Chrono24, Germany’s biggest marketplace for luxury watches, EXXETA, a consulting and IT solutions provider and the IISM of the Karlsruher Institut für Technologie. Even before the WUD itself started, this year’s Digital Experience Network DX-Award was conferred by the IISM. It honors the best innovative prototypes at the intersection between Computer Science, Economy and Design by collegiate teams. The first place was taken by a voice controlled social network for senior citizens, second came an app for improved completion of personal goals supported by social accountability and the third place was given to a platform for trading electrical energy locally. After a brief greeting including some background concerning the motivation behind hosting the WUD as well as a short introduction of the German UPA and thanks to the sponsors by Jonas Fuchs (CEO, Usertimes GmbH), the WUD Karlsruhe started with a talk by Daniel Höche (Head of Digital Experience, 1&1 Telecom GmbH). Under the heading “Design-sprint Teams: Continuous UX- & Shop-Optimization in Times of Bursting Road-Maps”, topics of the talk included the challenges that come with a systematic, continuous UX-optimization using iterative processes. Daniel Höche put special emphasis on the changing demands put upon designers by today’s fast-paced world that is under constant change. As an example for handling these preconditions that are constantly changing, he explained the iterative process of data-based optimization of the 1&1 online-shop. He further elaborated upon the composition of successful design teams. As a positive conclusion to the talk, Daniel Höche invited the audience to reconsider whether “bad” results of usability tests should always be considered purely negative. After all every result provides teams with new insights that can be incorporated into the product, which in turn will become better with every new version. 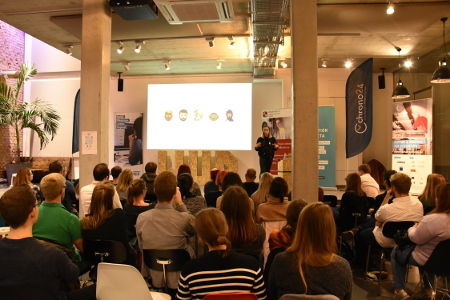 Completely in line with the original topic of the WUD 2018, Kira Tschierschke (Freelance UX Researcher, Brand Strategist) spoke about the topic “Good UX, Evil Consequences”. She considered the question how to design software in order to fulfill the company’s goals while considering the users’ needs at the same time and critiqued the use of dark UX patterns. Especially understanding users’ attention as some kind of currency for modern companies and thus trying to bind users to the software in every way possible. She also criticized UX patterns that lead towards behavior that is damaging users’ health (e.g. reduction of the sleeping time caused by Netflix’ or YouTube’s auto-play function) and patterns that lead users towards making unwanted decisions or exhibit unwanted behaviors (e.g. automatic opt-in). According to Kira Tschierschke, companies and “UX-providers” should always aim to unite the company’s interests with their users’ interests in a fair, responsible manner. The given impulses encouraged many constructive exchanges in the following break. The third talk “Design meets Development” by Dirk Anders (CEO CAS UXD, CAS Software AG) highlighted the intersection between design and development with all its obstacles. He considers a clean-cut distribution of roles and well defined processes as the key to managing the field of tension between development and design. Particularly the problem that the design process often seems to invite multiple—more or less qualified—opinions illustrates the need for a well defined distribution of tasks and roles within teams. On top of that the fact that designers and developers can have a very different view of the same mock-up or wire-frame should always be kept in mind. All in all Dirk Anders emphasized the interdependence between design and development, which makes collaboration all the more important, with the quote “If content is king, design is the castle”. The talks were concluded by Nancy Bullmann and Bernd Bullacher (Senior UX-Consultants, EXXETA AG) with their talk concerning the topic “Jack of all Trades, Master of None–How UX Designers are Able to Shine Using Knowledge from Different Areas”. The speakers didn’t focus as much on the customer’s perspective. Instead they discussed the question, how UX designers are able to better mediate within interdisciplinary teams and aid as a connection. Bernd Bullacher also broached the issue of communicating between designers and developers. Nancy Bullman proposed a more positive way of looking at troubles within the design process: according to her the EXXETA team tries to deal with confrontations in a constructive way and accepts backlashes as well as the fact that the development of product doesn’t usually work out just as planned but is a process with certain ups and downs. The official part of the WUD Karlsruhe was concluded by Jonas Fuchs at around 9 p.m. with information concerning other UX meetups and the Usability Testessen. The WUD gave participants the opportunity for networking and exchange in the breaks between the talks. As many lively discussions had already been started, the offer for open-end networking and discussions was gladly accepted. That way the WUD came to a pleasant–and in our eyes very successful–end. We’d like to thank our sponsors, the inspiring speakers and of course all of the participants and are looking forward to next year’s WUD. Speacial thanks also to the CyberForum for providing us with an awesome location as well as the constant support from the CyberForum team. For everybody interested in the WUD Karlsruhe 2019: we started a mailing-list which we will use to spread news and information as soon as we start planning the next WUD. Subscribe here! Download the slides used in the talks! Anne interessiert sich für alle Themen rund um User Research und -Testing sowie UX/Usability. Weil sie auch ihre Posts für die Nutzer schreibt freut sie sich über Diskussionen und Feedback.